The weather really was not improving with a mix of snow and rain to contend with cold cumbrian style! For a Sunday the Blease and Lonscale Fell route is ideal with a great descent down Latrigg to Keswick to finish. The route starts at the leisure centre in Keswick. If you park in the far bays then it is free! It is a good warm up along the disused railway line. About 5 miles of great scenery and easy pedalling to warm your legs up! Heading towards Threlkeld you take the road towards the Blencathra Centre. A steep road climb is the order of the day before you are rewarded with great views and the end of the road for the whole route. The trail is not technical but interesting enough to keep you occupied. The views down the valley are stunning even on a dark winters day. At the end of the valley you cross from Blease fell to Lonscale fell. The climb up to the top path has been sanitised a little but still provides an enjoyable climb. 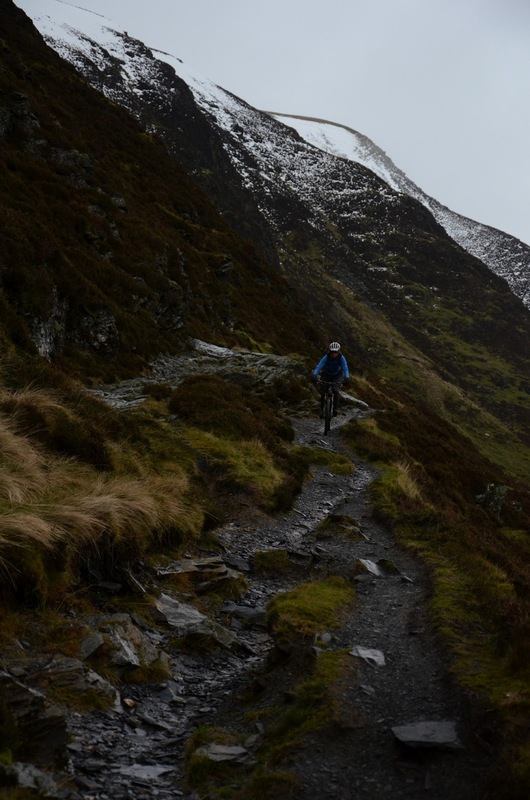 The trail traversing Lonscale fell has a challenging climb on it and a nasty rocky section with an interesting drop. The big drop makes this tricky. 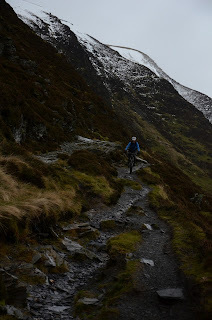 The route then traverses back around to the Skiddaw car park at Latrigg. From here the descent down Latrigg is fantastic but when busy it can get frustrating. At the bottom of Latrigg you cross the A66 via a bridge and turn left on the road to ride back to the leisure centre at Keswick. This route was voted best short route by MBR one year and it is easy to see why!